^ "A Short History of Federal Election Reform in Australia". 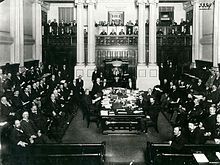 Australian electoral history. Australian Electoral Commission. 2007-06-08. Retrieved 2007-07-01. ^ Green, Antony (2004). "History of Preferential Voting in Australia". Antony Green Election Guide: Federal Election 2004. Australian Broadcasting Corporation. Retrieved 2007-07-01.